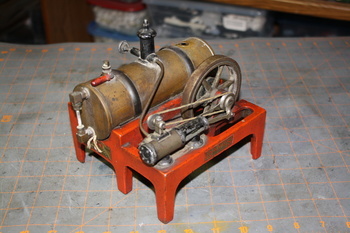 For my milestone 100th post, I thought I'd show my Weeden model steam engine. It took 7 months of brutal negotiations to land this item and it needs some work as it has damage and pieces are missing. The Weeden steam engines, founded by U.S. watchmaker William Nye Weeden, tend to be of a higher quality (and appearance) than some of the other brands as they were trying to compete with German companies like Marklin and U.K. companies like Mamod. I had never before seen a Weeden, mostly being familiar with the Jensen models which always had a cheap look to me due to the use of tin plate in their design. I knew I had to have it! 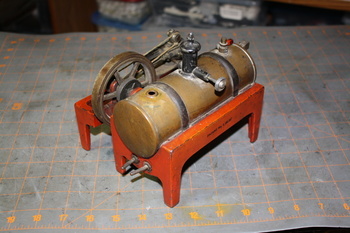 The model #647 is apparently a model #14 but with an electric burner. 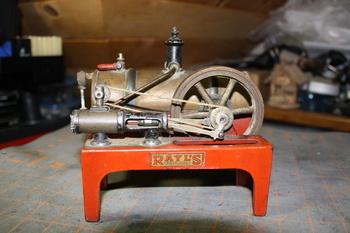 It dates to between 1927 and 1933 and new replacement parts are still available - this one needs about $80-$100 in parts. It's missing the entire filler assembly and safety valve as well as the simulated governor flyballs (for appearance only). The flywheel shaft is bent slightly so the flywheel has a bit of side-to-side wobble - am hoping I can get that turning true again. I did manage to get it running, although nearly scalded myself in an attempt to keep the top hole plugged in order to build up pressure. But at least I know it works with only a bit of boiler leakage around the sight-glass fitting (repairable with new seals). These "toys" were marketed to kids back then and they aren't even safe for today's adults! An interesting feature of this particular item is the co-branded decal on the side for Rayl's Hardware store, which I believe was located on Woodward Street in Detroit and eventually moved to Griswold Street in the 1920s. It measures 7" wide x 6" deep x 6" tall, and weighs a hefty 2Kg (4.4 pounds). I intend to restore it and get it fully functional again someday... for now I'm just pleased to have it on display. 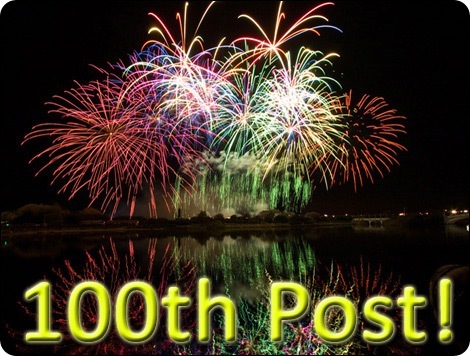 Congrats on your 100th Post !!! 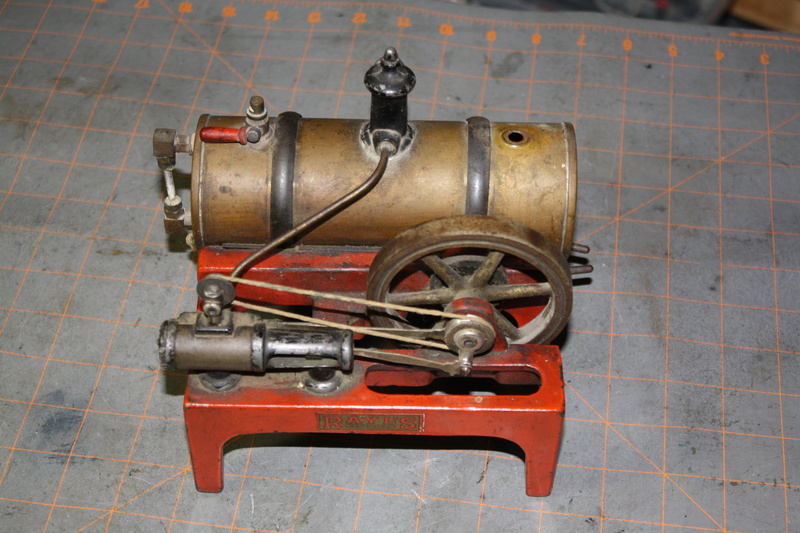 I like these little steam engines !! Thanks for the celebratory fireworks, antiquerose! Kydur, that is so amazing. I've never seen one of these before. Hard to believe what was marketed as toys to kids back in the day. I guess safety wasn't such a concern back then as it is today. Congrats on your 100th post my friend! !